After two years of work, the newly designed ArtsConnectEd launched a beta version on Monday. Kudos go to the entire team which includes the Walker and our partner, the Minneapolis Institute of Arts, combining new media and education staff with project management by Sandbox Studios and funding from an IMLS National Leadership Grant. It’s been an incredible collaboration both cross-institutionally and cross-departmentally, but special credit needs to be given to the Walker’s own Nate Solas and Brent Gustafson as lead developers for this project. Almost everything! The new site is completely redesigned as a dynamic and social Web site that empowers teachers, students, and museum educators in the creation and sharing of content and ideas in the process of learning about art. The new Art Finder offers an intuitive and powerful interface to the combined collections of the Walker and MIA, encouraging both wide exploration and in-depth research. Users can browse over 90,000 works of art, watch and listen to more than 1,000 video and audio records, and read thousands of articles and object labels. All of these resources can be collected in Art Collector and arranged as interactive presentations for personal or classroom use, which can in turn be published for others to use. 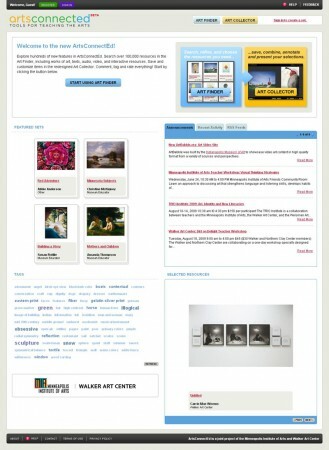 ArtsConnectEd also allows users to enhance their presentations with video and photos from services such as Flickr, YouTube, and the new ArtBabble video site. Another milestone was reached yesterday when we got our first user submitted Art Collector sets which are now added to the 50 (and counting…) published sets. Educators from both museums will continue to build new content, and we welcome more user submissions, as we prepare for a major push to teachers in September. Go to www.artsconnected.org , take a look, and tell us what you think. But be forewarned, once you start playing with ArtsConnectEd, it is hard to stop.